On August 1, 2015, the Consumer Financial Protection Bureau’s new mortgage disclosure rule goes into effect, requiring lenders to combine information from the existing Truth-in-Lending (TIL) disclosure and the HUD-1 Settlement Statement into one single disclosure for most residential mortgages. 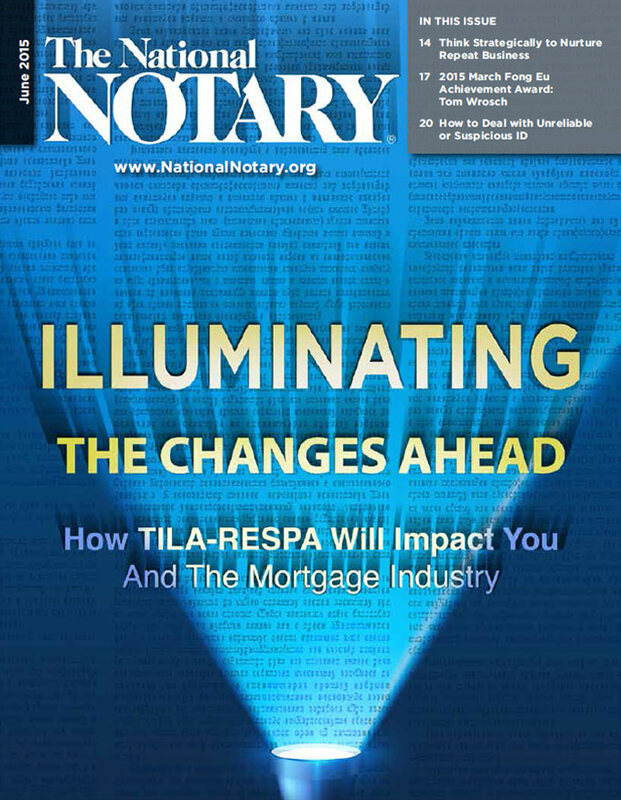 Nearly everything about the deadline is causing confusion and bureaucratic turmoil within the mortgage industry. But how does it affect you? While many questions remain unanswered, we shed light on the rule and what it potentially means for the way you do business. To make the most of any assignment, look at every signer as a potential, long-term client you’ll want to communicate with and nurture to create opportunities for repeat business. When Tom Wrosch first went to work for the Oregon Secretary of State, he realized that many Notaries didn’t know the basics of the job. So he spent years, crisscrossing the state giving seminars, and that’s just one of the many ways he has helped improve the Notary office. Over 320 million people live in the U.S. and millions of residents lack proper ID; questionable identification is a growing problem. And you are confronted daily with a dizzying array of IDs and identification scenarios — from worn out library cards and expired driver’s licenses to name changes and variations in appearance. So how do you solve the identity conundrum and carry out your most essential duty?